In the true Temple there is one offerer, one priest, who, again, is Christ. In baptism we all are anointed with grace as priests in the Kingdom of God; for the spiritual Kingdom is also the spiritual priesthood. Moreover, as the body of Christ, we have a priestly ministry to the world, fulfilling the very priesthood and intercession of the Lord Himself, so that to the whole universe we may proclaim the praises of Him who called us out of darkness and into His marvelous light. Footnote for 1 Peter 2:9 from the Orthodox Study Bible! The following list includes many of the regular opportunities open for participation at Holy Theophany, all of which are reliant directly upon us, and are supportive to the ongoing strengthening of our community. The emphasis on these opportunities is that they are not clergy run initiatives, but are the responsibility of the laity to serve Christ, serve one another, and minister to the world, as priests in His Kingdom. Youth Fellowship - Ages 13 through 18. Meets Saturday evenings after Great Vespers. Parenting Group - All mothers and fathers welcome. Meets Tuesday mornings. Ladies Study Group - Women's only group where a book/topic is studied together and discussed with Fr. Anthony. Meets Thursday Mornings, 9:00AM @ Old Church upstairs. Men's Study Group - Men’s only group where a book/topic is studied together and discussed with Fr. Anthony. Meets Friday Mornings, 6:30AM @ Pavlica Hall. St. Herman Home School Co-op - A cooperative group for focused education, unique presentations, and group activities for home school children, grades K - 12. Meetings are Friday mornings at the Church, 2-3 times a month. Project Mexico - Summer mission trip focused on building a home for a family in need in Mexico. Open to youth group age, young adults, and adult sponsors. Winter Youth Camp - Winter camp for youth group ages. St. Sophia Mission - The St. Sophia Mission is an outreach extension of our Parish. Please support the Mission through your prayers and by visiting the Mission’s Liturgy. The Mission is also open to full-time membership. Protection of the Holy Virgin Monastery - From semi-annual workdays, annual fire-wood collection, to group/individual/family day work - the nuns at the Monastery can always use our support. The Monastery is located in Lake George, just an hour from Colorado Springs. Contact Mother Cassiana directly: (719) 748-3999, for more information. Orthodox Christian Prison Ministries (OCPM) - The mission of the OCPM is to bring the love of Christ to those who are in prison by providing encouragement, material support, transition and reintegration services, Christian education, spiritual guidance and the sacramental life of the Church. This ministry has a strong local group serving prisoners in the Colorado and nationwide prison system. King Soopers Cards for the Ugandan Orthodox Church - By using a reload-able King Soopers card for grocery shopping, a percentage of the total amount spent is donated to Father Philumen and the Orthodox ministry in Uganda. There are no costs at all to the user. This very simple way of supporting this ministry has proven very effective and made an immense impact in the lives of those Orthodox Christians in Uganda who benefit from the funds. Mobile Chapel - The parish recently acquired a mobile structure which serves as a mobile chapel, which provides opportunity for exposure to Orthodoxy for the passerby. Potential venues range from farmer's markets, community events, festivals, etc. A core group is always needed to lead up the Mobile Church outreach. This is a unique opportunity to offer an Orthodox sacred space experience that can include an opening prayer service, blessing of holy water, anointing, lighting of candles, inviting people to come in and pray, and general conversational evangelism. 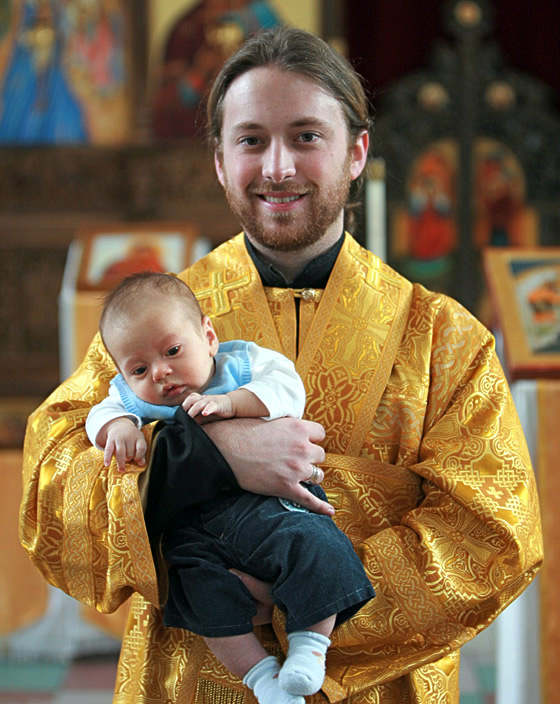 Holy Theophany doesn’t employ any regular service providers, but relies entirely on the dedication and loving service of the church members to meet the needs for the hospitality of the congregation and the maintenance of the Church and property. Temple Flowers - All of the flower arrangements in the Temple are provided by individual parishioners. We can all freely take part in this pious act of honoring the Lord, the Theotokos, and all the Saints with fresh bouquets. Vases are available in Pavlica Hall in the two upper left cabinets. No prior notice is necessary. Children’s Church School Teacher and Teacher’s Assistant - Children’s classes are offered for grade school children after liturgy throughout the school year. 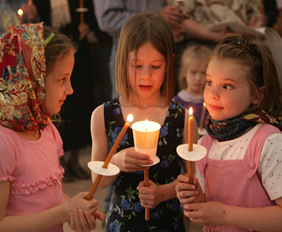 These classes help to teach our children about Orthodoxy, the Great Feasts, Saints and more in a relevant and fun way. Class teachers and teacher’s assistants are always needed. A background check is required and will be performed prior to working in any capacity with children. Choir - Always an opportunity to join the Church Choir, especially for those with a music/choir background and who enjoy singing. If you are interested in joining the choir, please see Matushka Elizabeth. Fellowship Meals - Our fellowship meal times offer an opportunity for us to serve our beloved community in the most natural way - through the sharing of a meal together. This presents a great environment to develop and nurture relationships within our community, while also providing an occasion for us to offer hospitality to guests and visitors - cultivating an easy-going atmosphere for discussion and reflection. Small groups (2-3 families or several individuals) prepare the meal for the parish. All able parish members are encouraged to participate in this service of love, once or twice a year. The sign up calendar is hanging in Pavlica Hall. Temple Cleaning - Our beautiful Temple is cleaned solely by parish volunteers. This service to Christ and one another is a simple way we can take seriously our ownership of the Temple we are so blessed to worship in. The quiet contemplative time spent while cleaning in the Temple is food for the soul. Cleaning takes about 2 hours and can be completed anytime, morning, noon, or night, around the service schedule. All able parish members are encouraged to participate. Grounds Keeping - From one time projects to regular maintenance - our grounds can always use volunteers to help tend the gardens, weed the rocks, sweep the walkways, clean the playground area, mow the grass, shovel the snow before a service, etc. Work appropriate for families and individuals can be arranged to fit your special interests and schedules. Building Maintenance - In an effort to build an internal database of our community skills, if you have a trade or technical skill which could be used on occasion as necessary, please let us know. From carpenter to HVAC tech, drywall to roofing, computer engineer to appliance tech, web designer to gardener, arborist to electrician, plumber to school teacher, medical professional to seamstress - any and all skills are beneficial, and it is great to know what is available.